For all the ‘con moto’ hype of modern-day Italian Baroque musicians in recent years – including Giuliano Carmignola sitting on a Harley Davidson for his DG Vivaldi disc – the interesting provenance of the solo playing here is its emergence from a generation of Baroque playing rooted less in ‘period’ equipment and concomitant expectations than in the spirit of the music, per se. The modern-instrument I Virtuosi di Roma – whose longevity, from the early 1950s, has had such a profound effect on the dissemination of Italian string concertos – are openly recognised in this generous quintet of concertos as a source of inspiration to Carmignola, as indeed are David Oistrakh and Isaac Stern. There is, however, no doubt that Carmignola is a man of his generation, choosing to work on Bach with one of the most versatile, pre-eminent and stylish of German ensembles. From the older generation, one can alight on the spaciousness of the playing, the robustness of rhythmic articulation and accentuation in the outer movements (really getting ‘into’ the string), and the overall unfussiness in the spontaneous intensity of Carmignola’s front-footed projection. Yet in the cool phraseology of the slow movements of both the A minor (BWV1041) and E major (BWV1042), more elegantly observational than intimate, a contemporary dialect prevails, most memorably in a sweetly flowing Largo from the great Double Concerto (BWV1043): the voicing of the solo parts, with Carmignola playing second, is a supremely distinguished essay in cultivated dovetailing and fresh dialogues. If there are moments where a ferocious attention to sound and virtuoso dazzle can seem a touch wearing, the effect is momentary since Carmignola’s urgency never leaves the listener breathless; agreeable inflections, such as the portamentos in the last movement of the Double, provide welcome coloration. Only in the outer movements of the G minor (BWV1056) – the F minor Harpsichord Concerto ‘reimagined’ – does the music ask for something more fluid, quixotic and rhetorical than Carmignola offers. 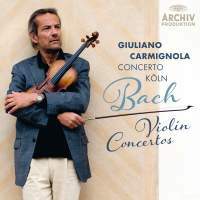 He certainly does so in the D minor Harpsichord Concerto (BWV1052 – a more natural fit for a violin in the genre does not exist), a performance of visceral resonance and poetic engagement which has never been bettered. One final general point: Carmignola does not edit out every impurity or ‘gamy’ tuning and the benefits to the character of the whole are incalculable.